According to a new study published Wednesday in Nature, recent estimates for sea level rise over the next century could be too low by almost a factor of two. In its latest report in 2013, the Intergovernmental Panel on Climate Change predicted a global sea level rise of between half a meter and one meter by 2100. Using reconstructions of sea level rise during past warm periods and new forms of ice sheet modeling, the authors of this new study think that Antarctica alone has the potential to contribute greater than 1 meter (39 inches) of sea-level rise by the year 2100. 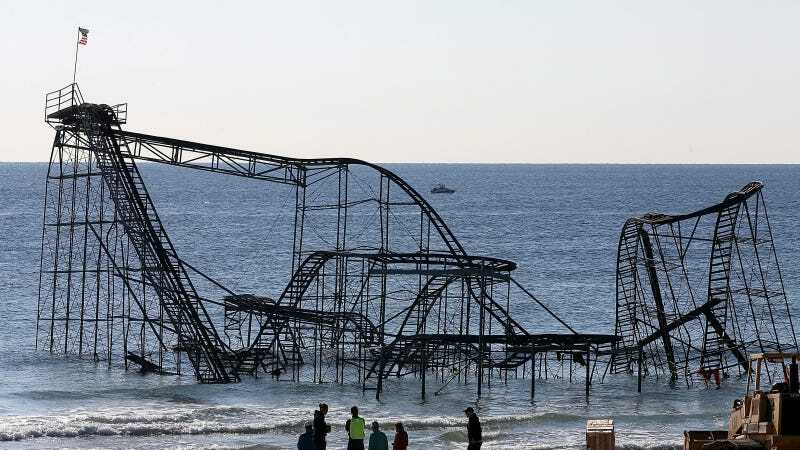 "This could spell disaster for many low-lying cities," said climate scientist Robert DeConto at the University of Massachusetts Amherst and a co-author of the study. "For example, Boston could see more than 1.5 meters (about 5 feet) of sea-level rise in the next 100 years." The scientists warn that if atmospheric greenhouse gas emissions continue unabated, ice melt from Antarctica could contribute nearly 50 feet of sea level rise by 2500. They state that eventually atmospheric warming rather than ocean warming will become the dominant driver of ice loss—although there is still time to avoid this worst case scenario through an "aggressive reduction in emissions" that limits the risk of major ice retreat in Antarctica. The warming of the atmosphere around the edges of Antarctica will melt a lot of ice and snow in the summer. They say that the planet has been in this situation before, and that when global temperatures were only slightly warmer than today during the Pliocene (around 3 million years ago) sea levels were much higher. The authors arrived at their model by trying to emulate past sea level rise scenarios. Once they found a match, they applied it to present day conditions to arrive at their conclusion—that much of the sea level rise must have been caused by Antarctic ice retreat, and that it could happen again soon. According to the study, most research into Antarctic ice sheet vulnerability has overlooked certain "under-appreciated processes" and focused on the role of ocean, which melts floating ice shelves from below. David Pollard, a climate scientist at Pennsylvania State University and co-author of the study, told me that their study takes into account hydrofracturing by surface melt and massive failure along exposed vertical cliffs. "The warming of the atmosphere around the edges of Antarctica will melt a lot of ice and snow in the summer, creating rivers and drainage on a large scale," he said. "Under a business-as-usual scenario, this melt will drain into crevasses and force open massive cracks." He said this notion is not outlandish and has happened recently to certain ice shelves. He also said that once the floating part of an ice shelf disintegrates, large vertical cliffs of ice up to 300 feet in height will be exposed. The pressure these cliffs exert will cause "slumping and catastrophic calving and very fast retreat." He said this has already been observed on some of the largest glaciers in the world. Pollard said that other recent studies modeling Antarctica's ice sheets focused on recent changes and didn't test their models on ancient records. He views this study as a warning, not a final word. "This is just a warning that these mechanisms could lead to drastic consequences," he said. "What should happen is more research." The findings of this study seem to align with a recent paper published by esteemed climate scientist James Hansen that found that at the current rate of global warming sea levels could rise by "several meters" over the next century. That paper, published in Atmospheric Chemistry and Physics, notes that in previous interglacial periods, sea level rose six to nine meters when temperatures were less that one degree Celsius warmer than today. Pollard said he wasn't qualified to comment directly on Hansen's research, as it relies on empirical data taken from around the globe and does not focus solely on Antarctica, like his research. The Antarctic Ice Sheet covers nearly 5.4 million square miles, around the area of the contiguous United States and Mexico combined. If the entire Antarctic Ice Sheet melted, sea level would rise by around 200 feet. According to NSIDC, air temperatures over the Arctic Ocean for December, January, and February were two to six degrees Celsius (four to 11 degrees Fahrenheit) above average in nearly every region.